Beleaguered by famine, terrorism and war, Somalia has the added burden of some of the highest energy costs in the world. But now relief is coming in the form of solar microgrids for refugees and communities thanks to an East African company. SolarGen Technologies is on a mission to help stabilize the country of 12 million people, using solar microgrids to cut diesel emissions and lower energy costs that are now as high as $1 to $3/kWh. With offices in Somalia and Kenya, the renewable energy equipment distributor expects to complete the first of its solar microgrids in Somalia in about two months. The project is slated to reduce energy costs to about 50 cents/kWh from roughly $1/kWh, said Sean Brooks, director of business development, SolarGen. The project is part of an international effort to help stabilize the area after its liberation from the Somali terrorist group, Al-Shabaab, in 2014, he said. SolarGen will describe its work in Somalia on the panel, “Microgrids for the Greater Good,” May 9 at Microgrid 2018 in Chicago. Funded by the Somalia Stability Fund, an international multi-donor fund, the 48-kW system will serve 175 households in Warsheikh, a coastal town north of Mogadishu, site of the battle depicted in the film Black Hawk Down. The microgrid is 100 percent solar and includes lead-acid battery storage, with diesel as backup, Brooks said. SolarGen will build the microgrid and operate it for two years, then transfer operation and ownership to a community-owned utility. “We will operate it for two years while the local community sets up its own utility company,” Brooks said. 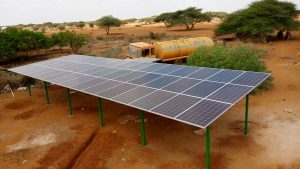 A second solar microgrid will be built by SolarGen in a new development for returning refugees in Kismayo. The effort is managed by the American Refugee Committee, which is building houses for the refugees. Funding for the microgrid comes from the UN High Commission for Refugees (UNHCR), with some help from the Somalia Stability Fund, said Brooks. Right now, the country has no national grid and fuel is 100 percent diesel. The private companies that provide power don’t use meters, but estimate usage. “They come to your house and look around at what you have and say, ‘You pay $5 or $10 a month.’ They see how many lights or appliances you have. It’s a shot in the dark,” he said. For these projects, SolarGen will install smart meters from SparkMeter. SolarGen’s goal is to create microgrids that are 100 percent solar, but it’s possible SolarGen will partner with diesel operators to convert some diesel plants into diesel/solar hybrid systems. 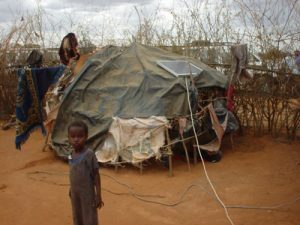 Over the longer term, SolarGen wants to raise funds from international donors and commercial investors to install 20 microgrids in Somalia over the next two years. The company wants to use the money raised to help pay consumers’ monthly electricity bills. Because the country has struggled for a long time, it receives about $1.4 billion a year from the international community, including people who have resettled to the US, UK, Australia and Europe and want to help their relatives in Somalia pay their expenses, Brooks said. “But the money, unlike the foreign assistance money, is scattered. Later in the year, we want to set up a website that helps aggregate those funds for specific community projects.” These might include medical clinics, said Brooks. Later, the company hopes it can use the money for larger-scale projects like microgrids. SolarGen has been using this strategy to fund solar-powered pumps for drinking water in Somalia. The company was founded by Abubakar Aidarus, who is the chief executive officer and an engineer. He started the company in Kenya as a student in electrical engineering at the University of Narobi in 2010. His first contracts were for small mini-grids–sized 3 kW to 5 kW—for 30 to 50 homes in Kenya. He then won the company’s recent Somalia contract from the Somalia Stability Fund, said Brooks. That fund is supported by contributors from Denmark, Sweden, Netherlands, Norway, Germany and the United Kingdom. Solar microgrids — and distributed energy in general — is the best way to provide resilient, lower-cost power to Somalia because building a national grid would be financially unfeasible, given the fact that the country’s population of 12 million is scattered over a large geographic area. 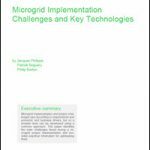 Join us at “Microgrid 2018: Markets and Models for the Greater Good” in Chicago May 7-9. Seating is limited. Register below. I believe in utilities that are not developed or are developing as Somalia and parts of the Northern Kenya frontier will benefit greatly from Mini grids. Solargen indeed represents the future in attaining SE4All. We have electrified about 1050 villages/hamlets through micro grids with SPPV Power Plants of capacities 1-25 KW with Lead Acid Batteries of appropriate capacity for energy storage in last 15 years in Chhattisgrah state of India . We are maintaining these plants since installation . Maintenance /Replacements of Lead Acid Batteries are major issues in micro grid .